Our Cloth Wristbands are manufactured from high-quality satin with tamper-proof black plastic one-way lock bead to comfortably wear for multi-day events. Printing them with full color logos, texts, and designs will allow you to use them as secured backstage passes at amusement parks, festivals, and sports events. The stylish and secured one-way closure bead will allow adjusting the wristband on your wrist and can be inserted effortlessly in one direction and can be removed with the use of scissors. Comfortable to wear, the closure beads can withstand usage of several days with exposure to water, but the fabric may or may not withstand excessive exposure to water. 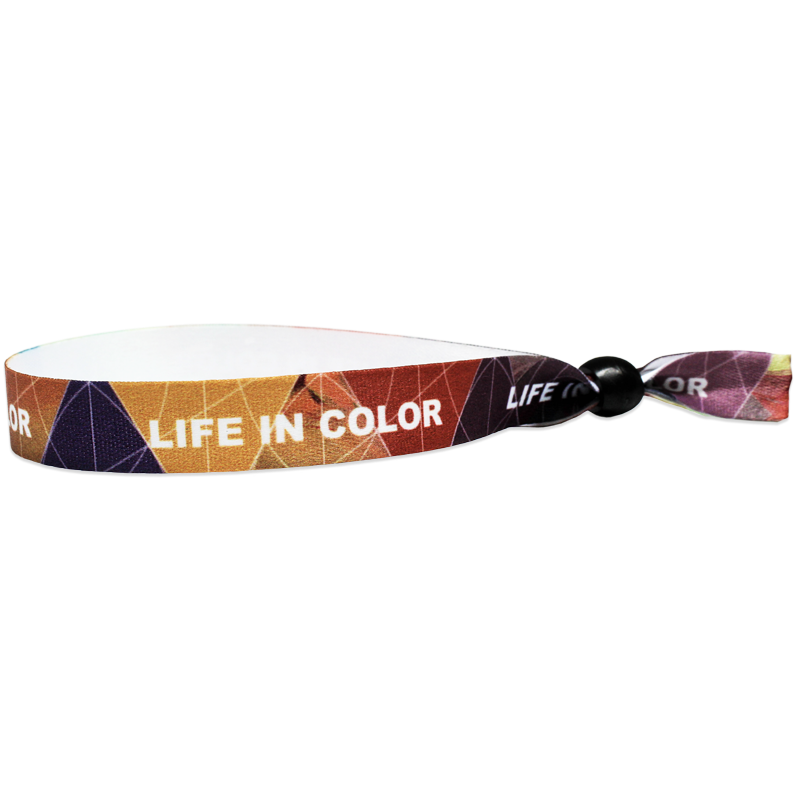 On these Cloth Wristbands, we can print the background colors or patterns from-edge-to-edge, but other important details like text messages, signature symbols, brand colors must be limited within the imprint area of the wristbands. However, as per customers’ requests, the background colors and patterns can be repeated or extended to the edges since this is outside of the imprint area. Therefore, get creative in designing your desired imprint in these wristbands to turn them into awesome souvenirs that people will want to wear again and again. Matched with your promotional needs, the wristbands will create ideal branding opportunities for your business. Also being highly hard to transfer, they will act as counterfeit-proof tools to prevent unauthorized access. The wristbands come in one-side printing by default. Black Plastic One-Way Lock Is Included Separately. The lock can only be inserted or removed in one direction to avoid the band falling off the wrist while wearing.